Sanita, Lebanon’s leading disposable consumables company is broadcasting a television commercial advertising Happies, starting October 29. Happies, Sanita baby diapers brand, is launching a promotional TV commercial with Nido on local Lebanese stations. The TV advertisement is divided into two parts. The first part explains how Happies is the nappies brand of choice for all babies. The commercial shows babies voting for Happies for its winning properties: great fit, comfort, absorption, and high level of dryness. The end of the commercial addresses the promotion Happies with Nido is providing. Customers have to collect 75 points with Happies to win Néstle Nido 1 plus can of 1.8 kg. Over the coming 3 to 4 weeks, the commercial will be broadcasted on main local TV stations LBC, MTV, OTV, Future TV, ANB, Al Jadeed, and NBN. Sanita is a member of INDEVCO Consumer Products, a division of INDEVCO Group, the 'Local Multinational of the Middle East'. MASTERPAK begins development of eco-friendly oxo-biodegradable plastic bags and films during the 1st quarter of 2010. In recent years the disposal of plastic products has stirred much controversy regarding the negative effects plastic has on nature and on wild life. Growing concerns have pushed lebanese polyethylene film manufacturer, MASTERPAK in Zouk Mosbeh, to look for a feasible solution. Polyethylene is a strong and durable material due to its molecular composition and strong chemical bonds and thus does not degrade easily. These characteristics, however, are the reasons behind why plastic is appropriate for packaging uses. MASTERPAK, through the use oxo-biodegradable plastic additives, targets all concerns about normal plastic, as well as degradable plastic. Polyethylene is attractive for packaging purposes, due to its strength, flexibility, as well as water and air resistance. Thus, while finding methods to speed up the degradation process of plastic it is also vital to preserve these key characteristics. MASTERPAK produces eco-friendly plastic that has all the normal characteristics of plastic but oxo-biodegrades. The oxo-biodegradable additive combined with the polyethylene is usually at a low level, resulting in a negligible impact on the finished product. The plastic packaging film or bag still retains the characteristics: strength, impermeability, clarity, and sealability. Furthermore, no changes are required in the plastic manufacturing process, as well as no affect on line speeds. Bio-degradable plastic needs to be exposed to a biologically active environment to begin degrading. An example of such exposure is by burying the plastic product in the soil. This disposal system, however, is not always effective with plastic packaging resurfacing and polluting the environment. MASTERPAK oxo-biodegradable polyethylene films and bags do not need a biologically active environment to begin degradation. The plastic degrades under many different conditions, even if only exposed to open air. After degradation the plastic will break down to harmless H2O, CO2, and negligible amounts of biomass. Furthermore, totally degradable plastics can be recycled. A common concern about degradable plastic is the plastic durability and life, whether degradable plastic will last as long as necessary. Some plastic bags and films require long life durability while others such as a bread bag might need a few weeks. MASTERPAK’s totally degradable plastic is unique, due to the controllable nature of the degradation process. Thus with the use of stabilizers, plastic films and bags can have a sufficiently long useful life according to the product requirements. By controlling the additive composition, oxo-biodegradable plastics can degrade from as early as 60 days to as long as 6 years. Is the Additive HarmfulAnother concern manufacturers of degradable plastics are facing, is the question of whether the additive in plastic packaging is harmful when coming in contact with food and beverage products. MASTERPAK uses a small harmless percentage of an oxo-biodegradable additive made of metal salts. Tests have proven that this oxo-biodegradable plastic is safe to come into direct contact with food and beverage products. CEDEX Plastics will exhibit flexible packaging products at PACK EXPO International 2010 from 31 October - 3 November 2010. The co-extruded polyethylene film manufacturer will be promoted at Booth # 4057 by Exopack during PACK EXPO 2010 held at McCormick Place in Chicago. CEDEX Plastics is a joint venture between Exopack, flexible packaging group headquartered in Spartanburg, South Carolina, and INDEVCO, a multinational packaging and consumer disposables manufacturing group headquartered in Ajaltoun, Lebanon. Exopack and INDEVCO invite attendees of the annual packaging and processing show to visit Exopack’s booth and view CEDEX Plastic’s innovative film solutions: AquaCrystal ® Select high clarity shrink wrap and CaseFLEX™ case overwrap film for the beverage industry. Booth visitors can meet with Virag Patel of Exopack’s Global Packaging Linx initiative, and Walid Boustani of INDEVCO Flexible Packaging and discuss benefits of the displayed films. AquaCrystal Select high clarity shrink film from CEDEX Plastics are proprietary-blend high-clarity, high-gloss PE shrink films designed for multi-pack bundling systems. The fully recyclable polyethylene-based resin package can be tailored for individual applications. Furthermore, specific shrink properties ensure the integrity of a package through distribution and onto the retail shelf, offering a cost-effective choice for outstanding billboard graphics on its printable surface. CaseFlex™ Select, a tough, thin-gauge, non-printed polyethylene case overwrap, is ideal for packing multi-pack applications that do not require total enclosure. The non-stick shrink film can be down-gauged lower than most films while still providing exceptional strength and durability. CEDEX Plastics leverages on the combined experience and expertise of Exopack and INDEVCO in North America and the Middle East and capitalizes on Middle East resin pricing to formulate cost effective film blends. Furthermore, CEDEX Plastics’ ensures consistent high quality by investing in top-of-the-line production machinery. The PE film manufacturer benefits from optimized shipping routes and relationships with pre-screened ocean carriers and clearing houses. This speeds up the shipping process from Lebanon to North America, enabling CEDEX plastics to provide time-efficient delivery. Attendees can arrange appointments for on-site and off-site meetings with CEDEX representatives by contacting Virag Patel on virag.patel[at]exopack.com. For more information on flexible packaging films, visit CEDEX Plastics website at www.cedexplastics.com. Saudi Arabian PE film manufacturer, Uniplast, has penetrated the UK market for plastic packaging through intensive and well-thought strategy formulation and aggressive implementation. The United Kingdom is a prominent market in the plastic industry; however, penetrating this market is not easy with existing highly competitive players dominating the market. Uniplast, allocating 80% of its revenue to its export business, approached the UK market leveraging on its experience, know-how, and capability as well as tackling possible future threats in the market. Furthermore, forecasts state that growing awareness of environmental threats posed by plastic packaging disposal will limit the plastic packaging industry’s ability to expand greatly. Uniplast, however, has already begun oxo-biodegradable plastic film production trials, thus taking a proactive approach to the imminent threat in the market’s near future. Uniplast adopted a market development strategy by entering the new market with pre-existing products. Uniplast’s strategy targets medium to large size wholesalers and packaging material manufacturers and focuses on providing good quality plastic films at competitive prices. The polyethylene film manufacturer capitalized on sister company, Sanita UK’s established position, facilities and know-how in the UK market. Furthermore, the new entrant, Uniplast, leveraged on Sanita UK and the regional unit’s networking skills to spread its name throughout the market. With this support, Uniplast benefits from expansion initiatives, such as local invoicing, credit facilities, and after-sales services. Uniplast’s success in effectively entering and gaining position in the UK market is attributed to exercising efficient and timely communication with Sanita UK and the regional team. The interaction and clear feedback between these three pillars attribute to a competitive edge over other overseas manufacturers. Local suppliers, without hesitation, established strategic partnerships with Uniplast for products, such as manual stretch film , machine stretch film, refuse sacks, pallet covers / top sheets, as well as other plastic PE films. A significant sign demonstrating Uniplast’s success in penetrating the UK plastic market lies in the customer base it has acquired in such a short period of time. Uniplast secured a significant market share in the United Kingdom by attracting marketing leaders: Manuli packaging, Eurofilms, Britton Taco, Golden Valley, IG Industries, Siva Plastics, Polythene UK, Bunzl and Castleview. “Entering the UK market was a challenge. It was a test to prove our ability to deliver commodity products in a very competitive environment with high customer expectations in terms of quality and on-time delivery. Uniplast had to revise and improve all of its cost elements from its resin blends to shipping cost to remain competitive vis-à-vis other European manufacturers dominating the market. Interstate Resources Executives attend Specialty Graphic Imaging Association (SGIA) Expo 2010 held in Las Vegas Convention Center. Interstate Resources operates plants manufacturing kraft linerboard, recycled medium, corrugated sheet and corrugated converting products in Georgia, Maryland, Massachusetts, New Jersey, North Carolina, Pennsylvania, and Tennessee. Corrugated packaging produced include point-of-puchase displays, retail ready and shelf ready packaging, wax alternative corrugated packaging, and corrugated cartons. Neemat Frem, INDEVCO President & CEO and President of Association of Lebanese Industrialists (ALI), will participate in the annual conference, Business Opportunities in Lebanon. Business Opportunities in Lebanon, year eight, will take place at the Dbayeh Convention Center during 19-21 October 2010. Frem, representing ALI, will participate in the discussion panel of the inaugural ceremony to be held on Tuesday, 19 October 2010. The keynote speaker of the inaugural ceremony, Prime Minister Saad Hariri, will discuss his plan for the coming decade concerning infrastructure, technology, the environment, and Woman’s involvement in public service. CorrPak® 2010 competition awards the finest commercially produced corrugated products in the industry. The competition took place during Corrugated Week 2010 on 4-8 October in Baltimore, Maryland USA. Dave Doberstein, Interstate Container Reading Plant Manager, served as one of five structural judges, while George Salloum, Interstate Resources Graphics and Design Development Engineer, served as one of the five judges for printing awards. CorrPak® reviews the world's most innovative and high-ranked commercial corrugated packages. Interstate professionals were invited to judge the biennial competition due to their knowledge and experience in packaging design and printing. Insterstate Container Reading manufactures corrugated retail-ready packaging (RRP), shelf ready packaging (SRP), point-of-purchase (POP) displays, counter displays, corrugated and specialty sheets. The annual convention, Corrugated Week 2010, organised by the Technical Association of the Pulp & Paper Industry (TAPPI) and Association of Independent Corrugated Converters (AICC), gathers decision makers in the corrugated industry. The event provides an arena for networking, training, problem solving, one-on-one communicating and exhibiting. Interstate Container Reading of Reading, Pennsylvania is a member of Interstate Resources, Inc., a member of INDEVCO Group, the 'Local Multinational of the Middle East'. Phoenix Machinery, Lebanese machinery manufacturer, signed the SIEMENS solution partnership contract on 4 October, to meet changing customer needs. The partnership demonstrates Phoenix Machinery’s superior quality meeting global standards. Phoenix Machinery works with SIEMENS to provide high quality service and expertise, meeting customer requirements. This partnership comprises of three fields of cooperation: Automation, Human Machine Interface (HMI) and Motion Control. Phoenix Machinery develops and integrates innovative and cost-effective automation solutions. The system integrator serves the industrial field system integration covering machinery automation, process automation, and power distribution, while SIEMENS provides automation technology products that are engineered and manufactured for all industrial sectors. Together the two partners form a symbiotic partnership each providing distinct competencies and expertise. 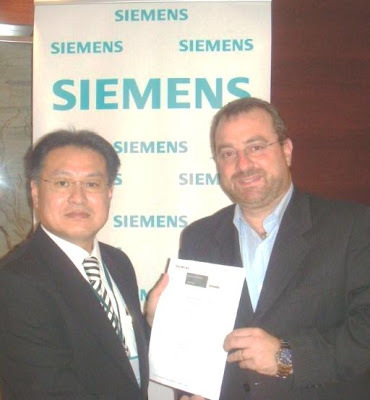 The SIEMENS Solution Partner Program forms strategic alliances and symbiotic business relationships. Due to technological innovations shaping the global market, as well as customer and competitive environment, this partnership program aims to adapt and meet ever-changing customer and market demands in order to maintain market position. SIEMENS solution partners from around the world serve the Automation and Product Lifecycle Management (PLM) sectors as solution providers. These certified system integrators offer their expertise in product and systems, as well as their vast knowledge and experience in the industry. As a solution partner, Phoenix Machinery receives technical, commercial, sales and marketing support, thus systematically developing expertise and providing clients with the best possible solution quality. The level of success in innovative and complex projects depends on the search for the best automation solution. For every project, SIEMENS assigns an application engineer to Phoenix Machinery to help discuss technical aspects of the project. Through this synergy, Phoenix Machinery receives technically and economically optimized solution proposals. SIEMENS guarantees the function and performance of these proposed solutions. The certification from SIEMENS indicates that Phoenix Machinery quality standards are qualified to a uniform global standard. These requirements for SIEMENS Solution Partners Program cover four quality characteristics. The collaboration of SIEMENS and Phoenix Machinery reduces customer risk through the use of SIEMENS parts with efficient operation. Furthermore, with their combined expertise directed to a defined target, clients are always paired with the appropriate product to meet their customer requirements. Through regular workshops and audits, SIEMENS’ partners transfer know-how on product range, as well as certify technology knowledge, quality and project management in tests and evaluations. Through the synergetic collaboration between SIEMENS and solution partners, clients benefit from comprehensive solutions. Associated synergies help cut time-to-market significantly and give a clear innovative lead-in solution implementation. The SIEMENS Solution Partner Program provides clients with a comprehensive portfolio of services and products from which clients can benefit from the most appropriate solution partner advice, according to its requirements. Customers benefit from continuous manufacturing optimization throughout the lifecycle of machines and plants by offering solutions from machine engineering through smooth machine operation, expansion and upgrading. Electrically operated building installations need a supply of reliable and efficient power flows to ensure operation. This further reflects the importance of integrated solutions for an effective power supply system. Through the SIEMENS Solution Partnership, Phoenix Machinery benefits from Totally Integrated Power (TIP) which includes tools, planning support, and totally synchronized product and system range for integrated power distribution. SIEMENS offers partners Product Lifecycle Management (PLM) software which secures success in translating ideas into products. Phoenix Machinery is a memeber of INDEVCO Group, the 'Local Multinational of the Middle East'. Phoenix Machinery partakes in the UNESCO seminar called 'The Future of Technical Education in Lebanon' held at UNESCO palace on 2 October 2010. Phoenix Machinery demonstrates dedication to the improvement of the Lebanese technical school curriculum by presenting at the seminar organized by the Institut Européen de Coopération et de Développement (IECD - European Institute for Cooperation and Development). Under the patronage of the Minister of Education and Higher Education, Hassan Mneimneh, the seminar addresses the reasons behind the decrease in the number of students enrolling in industrial specifications in technical schools. The seminar continues to present solutions by setting forth a new curriculum aimed at improving student ‘Electro-Technique’ skills for the Technical Baccalaureate Level. Rabih Osta, Phoenix Machinery General Manager, overviewed the current situation and addressed key factors affecting the technical education system in Lebanon. He continued to discuss industrial market needs and how the new curriculum meets these needs. Finally, he presented suggestions for the future progression of the technical education system. Osta emphasized the need for a new curriculum that covers mechanical and electrical aspects of new machineries and provides courses related to work quality, international standards, planning and communication. Furthermore, he highlighted the importance of adding new equipment in technical school labs. Osta pinpointed the necessity to establish a training program for teachers and a periodic review of the curriculum to constantly remain in-tune with industrial changes and market needs, as well as technological improvements. Phoenix Machinery and a member of INDEVCO Group, the 'Local Multinational of the Middle East'. INDEVCO Consumer Products Division’s Regional Modern Trade Unit organizes a 3-day workshop called ‘Modern Trade Workshop’ on 29 September - 1 October 2010. The regional workshop held at the Grand Hills Village in Broumana, Lebanon, brought together Middle Eastern and North African (MENA) regional commercial managers as well as Napco KAM – Key account managers. The managing partner of Napco is INDEVCO Group. The goal behind the workshop was to share know-how in the modern trade sector and address the latest developments in the sector. The event strengthened the business relationships between Napco and INDEVCO their main regional customers. Guest speaker Brian Moore, a modern trade specialist, presented the first workshop, Effective Retail Management, on 29 September. The workshop addressed the relationship between key account managers and commercial managers of the main Gulf Consortium Corporation (GCC) retailers. Brian Moore, EMR-NAMNEWS Ltd. Managing Director, has a marketing and key account background and has conducted numerous workshops involving major key accounts and retailers. Furthermore, he has prior experience in the Gulf region. The second day had guest speaker Rabih Rizk from STARMANSHIP & Associates, training and consulting services provider for Lebanon and the Middle East region. During this session, Rizk delivered an experiential learning workshop called ‘Rattle Snake Canyon’ program. This program helps participants develop effective partnerships, build team effectiveness, and overcome environmental pressures. “I believe that the efforts of our regional Modern Trade Unit team to foster partnership with our key account customers will drive business in-line with our company’s strategy. On the final day, attendees visited the Jeita Grotto, Lebanese natural wonder in the process of entering the New Seven Wonders of the World. They continued the day with a trip to one of Lebanon’s most prominent beach resorts, Eddé Sands in Byblos, Lebanon. INDEVCO is a managing partner of Napco and INDEVCO Consumer Products is a division of INDEVCO Group, the ‘Local Multinational of the Middle East’.